As a parent, you know that giving your kids creative license can often end in big smiles, and big messes. At Best Way Carpet and Tile Cleaning, we are proud to be able to let parents to continue to allow their kids to get creative by aiding in any necessary upholstery cleaning in NJ. Among the favorite tools of children is the very bright, and very permanent, Sharpie. No matter what color your couch is, a Sharpie stain can be very unsightly. Fortunately, these stains are relatively simple to combat. Homeowners should spray the stain with WD-40 and then apply pressure to the stain with a cloth. You can also choose to dab the stain with fingernail polish or with a baking soda and water paste. While less permanent than Sharpies, glue can certainly leave a messy stain on your carpet or couch. Parents looking at a glue stain will want to let the glue dry, and then remove large residue using a butter knife. Once as much of the glue as possible is removed, you’ll want to wet a cloth with white vinegar and liquid dish soap and then blot the area clean. Did your kids get their hands on crayons and color more than just the paper? Our team can help. If crayon got on your upholstery, parents can freeze the stain using an ice cube wrapped in a plastic bag and then wipe the stain clean using a solvent used for dry-cleaning. If the crayon stain is on your carpet, parents can try to freeze it the same way they would for an upholstery stain. If that doesn’t work, you may want to try spraying the stain with WD-40 and then adding liquid dish detergent to remove what is left of the stain. At Best Way Carpet and Tile Cleaning, we are proud to be able to offer our customers the tips and tricks they need to remove minor spots and stains from their carpet and upholstery. 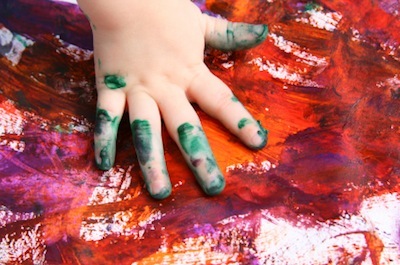 Parents who need extra help dealing with stains from art projects gone wrong can give our technicians a call to schedule an appointment for carpet or upholstery cleaning in NJ as soon as possible. This entry was posted on Thursday, October 24th, 2013 at 9:04 am and is filed under Upholstery Cleaning.